Aerie is a lingerie brand and subsidiary outlet of US clothing company American Eagle Outfitters, aimed at the 15 to 22 year old female demographic. It was founded in 2006 with its own stand-alone store in Greenville, South Carolina. Since then just short of 150 stores have opened, as well as American Eagle stores themselves stocking the brand. These stores are currently only located in the US and Canada. Aerie has become so successful that in the financial year ending 2013, the brand made more profit than American Eagle itself. 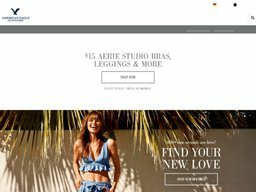 Today the company is headquartered in Pittsburgh, Pennsylvania, United States, and the brand is also sold online through an Aerie section of the American Eagle website. Here you can redeem special Aerie coupons for savings and other offers, which we list here at Coupofy. We always keep these up to date. so be sure to check back whenever you order to see what's available. You can also use Arie printable coupons if you prefer to shop in store. Aerie has become known for using "real" models in its campaigns, meaning there is no digital retouching or editing, and plus size models are used to promote their associated sized items. Aerie lingerie and intimates can be purchased online at AE.com/aerie which is a separate site contained within the main American Eagle online store. Saving money when shopping at Aerie is a breeze. The company frequently runs its own promotions to help you save. These typically come in the form of aerie coupons for free shipping. However, you'll definitely find plenty of other offers released regularly. Aerie's lineup focuses on lingerie and intimates of all sizes for women. These are categorized online via Bras, Undies, Swimwear, Tops, Bottoms, Dresses & Rompers, Sleepwear, Accessories, Fragrances, and Clearance items. There are also sections doe gift cards, New Arrivals and Online Only specials. If you are unsure what to buy there are handy Bra and Undie guides, and a page called "Aerie Looks & Loves" to help you decide on a look and style. When you enter a specific category there will be further categories to narrow down your search (such as sports bras), and you can also choose a budget range, size and other parameters. All Aerie items are their own brand, they do not stock items from other brands. If you want to shop in the main American Eagle store, your orders will be combined in the same basket. If you want to make savings on your Aerie lingerie orders you can apply one of the Aerie coupon codes during the checkout process. Simply click one of the links here at Coupofy to be taken directly to the store. Customers have a wide range of payment options when shopping with Aerie. You can pay for your order using virtually any major debit or credit card. Another option is to use Paypal or Paypal credit. Also, if you have a gift card, then you can use that to pay for merchandise as well. Orders can be bought and shipped worldwide, not just in the United States. You simply have to choose your location, currency and other regional settings by clicking the flag in the top right hand corner of the page. Most of the time this will be done automatically. In the US standard shipping is $7. When the value of the order reaches $50 standard shipping is free. All gift card purchases also come with free shipping. Sometimes you can get free shipping regardless of the order value by using a special Aerie coupon. International shipping costs vary, but will be made clear during the checkout process. All taxes and custom fees will be included in the final price so there are no hidden costs. It's very simple to return any merchandise that you're no longer interested in keeping. You have the option of sending online purchases back via the mail or taking the items back to an aerie store.